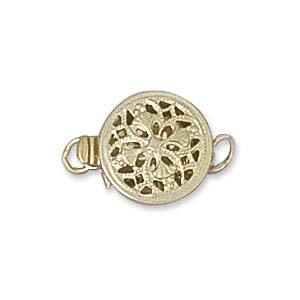 Gold Fill Filigree 1 Strand Square Clasp, 13.5x8.5x4mm. Gold Fill Filigree 3 Strand Rectangle Clasp, 12x10mm. Gold Fill Smooth Toggle Clasp, 21x18mm. Gold Fill Tube Crimps, 2x1mm. Pkg of 50. Tube Crimps are the best for giving a professional finish to your work. Gold Fill Tube Crimp, 2x2mm. Pkg of 50. Tube crimps are the best for giving you a professional finish to your work. Gold Fill Earring Ball Stud with Loop. Butterfly's included. Sold Per Pair. Gold Fill Earring Ball Stud 4mm with Loop. Butterfly's included. Sold Per Pair. Gold Fill Ear Thread, 4.75" Chain with Loop. Sold Per Pair.